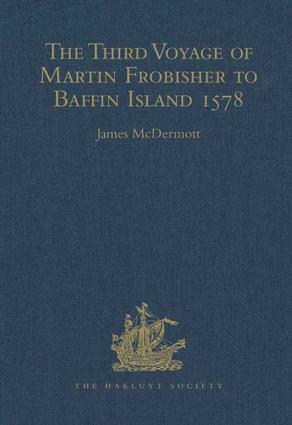 Martin Frobisher's third (1578) voyage to Baffin island was the consequence of flawed logic and excessive optimism on the part of the adventurers of the ephemeral 'Company of Cathay'. Their original intention - to find a north-western route to the Far East - had been largely forgotten following the imagined discovery of gold - and silver-bearing ore in Meta Incognita (the Unknown Limits), as Elizabeth I had named the forbidding and icy landscape which Frobisher and seventeen mariners had first sighted two years earlier. This was to be the English nation's first experience of a 'gold-rush', and if many refused to be swayed by the promise of an empire to rival that of Spain, others, including the Queen herself and many of her Privy Councillors, allowed their cupidity to override all caution. As the likelihood of future profits was downgraded in successive assays of the mineral samples, the adventurers accepted that a much larger expedition would be required to extract sufficient ore to provide an adequate return upon monies already spent. The result - a fleet of fifteen ships, crewed by almost five hundred men - remains the largest fleet ever to have visited Baffin Island. Their travails in arctic seas, near-comic failures of navigation and the backbreaking task of mining the largest possible amount of mineral ore in the time allowed by the brief arctic summer, were recorded in an unsurpassed body of eyewitness reports, all of which, for the first time, have been assembled in a single volume. Supplemented by extremely detailed and opprobrious (though substantially accurate) accusations regarding Frobisher's role in this enterprise by his ex-partner, the merchant Michael Lok, these records provide a graphic, poignant and often humorous picture of a voyage which foreshadowed the glorious failures of a later age of English empire-building.